Compare Tata Nexon vs Ford EcoSport vs Maruti Vitara Brezza – Specifications Comparison. 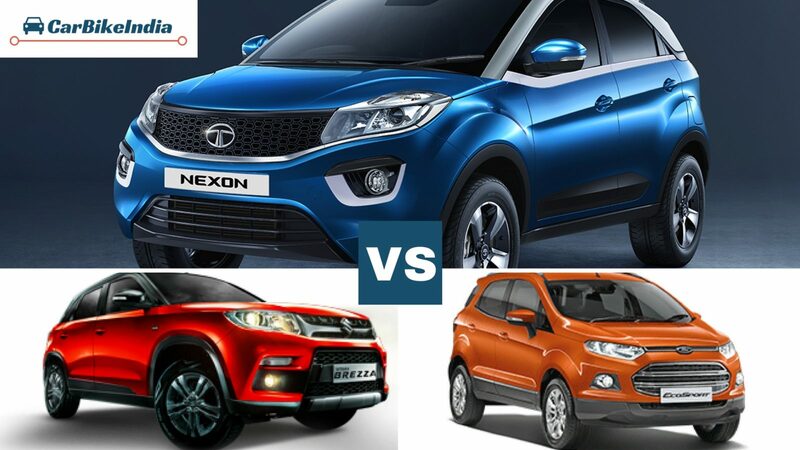 Compare dimensions, engine capability and prices of Tata Nexon, Ford EcoSport and Maruti Vitara Brezza. Tata Motors took the country by storm with its latest launch, the Nexon. To everybody’s surprise, the Tata Nexon was launched at an unbelievable price of Rs 5.85 lakh (ex-showroom Delhi) undercutting all its rivals. This price point becomes all the more important as the Tata SUV gets dual airbags and ABS with EBD as standard across its trims. With contemporary looks, spacious cabin and fuel efficient engines, the Nexon looks to rejig the compact SUV segment comprising of the Maruti Suzuki Vitara Brezza and the Ford EcoSport. Let’s head straight to their specs to know which one has that zing to outshine the others. Here you go. All three cars are neck-and-neck with respect to their lengths with the EcoSport being marginally long at 3999mm. The EcoSport is the tallest as well followed by the Vitara Brezza and the Nexon. With 1708mm height, the headroom isn’t a problem for rear occupants in the American SUV. While the EcoSport is the narrowest, the Tata Nexon is the widest of the lot ensuring the third passenger gets adequate shoulder room to sit at rear. With respect to wheelbase, the EcoSport grabs the top spot, followed by the Maruti and the Tata SUVs. However, the Nexon stands tallest above the ground with 209mm of ground clearance; the EcoSport comes second at 200mm while the Brezza rests at the third spot. Interestingly, the Brezza fails to get an upper hand in any of the dimensions listed yet it is the segment leader. Surely, the dimensions aren’t the only parameter to judge a vehicle. Let’s get underneath the bonnet to find out what pushes these SUVs. Surprisingly, the Maruti Suzuki Vitara Brezza misses out on the petrol option at a time when every carmaker is looking to add a petrol variant to its SUV lineup (Read: Mahindra, Audi). The EcoSport is offered with two petrol engine options – a 1.5L and a 1.0L EcoBoost. Both the engines produce more power than the Nexon’s 1.2L motor. The EcoBoost engine, in particular, musters an impressive 125PS of max power. The Nexon beats the bigger mill and equals the smaller one of the EcoSport by producing 170Nm of peak torque. While the Tata SUV gets a 6-speed manual gearbox, the Ford SUV packs in a 5-speed one. Moreover, a 6-speed automatic option is also available with the 1.0L motor. The mileage of Nexon (17kmpl) falls short of the one returned by the EcoSport’s 1.0 turbocharged engine (18.88kmpl). The Nexon and the EcoSport bear similar capacity diesel engines (1.5L), while the Maruti SUV gets a smaller one (1.3L). The Tata Nexon beats the other two comprehensively by generating max power of 110PS and max torque of 260Nm. The EcoSport comes second with figures of 100PS/205Nm while the Maruti Vitara Brezza comes last at 90PS/200Nm. The Nexon continues to get the 6-speed manual gearbox with the diesel as well, whereas the Ford and Maruti Suzuki settle for a 5-speed manual one. Moreover in the crucial mileage department, Maruti Suzuki convincingly beats the other two by returning an excellent fuel economy of 24.30kmpl. The EcoSport catches it with 22.27kmpl while the Nexon relaxes at the last spot with 21.5kmpl. The Ford EcoSport and the Maruti Vitara Brezza are head to head when it comes to price. The Ford compact SUV’s price ranges in between Rs 7.10 – 10.71 lakh whereas the Brezza costs Rs 7.24 – 9.91 lakh (both prices ex-showroom Delhi). Everything was going smoothly until the time, the Nexon was launched. Disturbing the segment, the Tata SUV undercuts all its rivals with a super aggressive price of Rs 5.85 – 9.44 lakh (ex-showroom Delhi). After through going all the details, we believe the Nexon is here to mess with the equations of all other players. The quirky yet stylish Nexon is our pick of the lot considering its appealing looks, powerful engines, cabin space, features and, of course, the killer price tag. Pingback: Ford EcoSport Facelift 2017 Launching On November 9, Features Leaked!